He built also, on the opposite side of the way, a church, to the honour of St. Gregory, where he placed canons regular, who should administer spiritual comfort and assistance to the infirm people above mentioned, and take the care of their funerals, for which he provided them with such an income as was thought sufficient. Part of this priory is still standing, and many fine old arches and windows of the Saxon and Gothic order, may be seen. The belfry is also still remaining; but the whole seems from time and desolation, sinking "in ruinous decay." It is now made use of as a pottery and tobacco pipe manufactory. The ground belonging to its precincts, was formerly almost entirely laid out in gardens for the supply of our markets; but since the commencement of the late war, buildings have been erected on it, for the accomodation of the military, called St. Gregory's barracks. The chapel of St. Thomas (whose ruins were till within these few years remaining) had over the door, at the west end of it, a handsome old arch, which the archbishops lessee took down some years since, to make a portal to his own dwelling house, at St. Thomas's Hill; but that being sold and rebuilt, the Rev. Mr. Brockman, by adapting the front of one of his out-buildings to it, has preserved this piece of antiquity, and added to the beauties of his seat at Beachborough, near Hythe. "St. Gregory's Priory - an extensive burying-ground was attached to it, not appropriate to the hospital alone, but to the parishioners of Northgate." 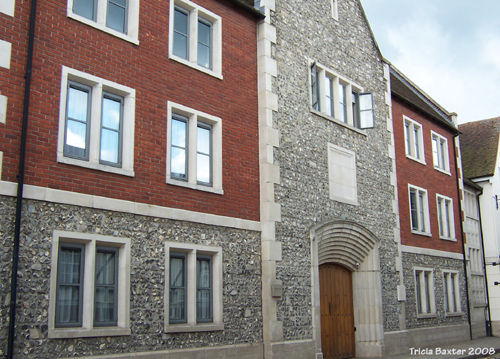 "St. Gregory's Hospital, founded by Archbishop Lanfranc; valued at the reformation at 166l. 4s. 5 1/2d. yearly, now worth 3,328l. 9s. 2d. ; granted to the Archbishop of Canterbury." "The priory of St. Gregory, according to Tanner, was founded by Archbishop Lanfranc, in A.D. 1084, for infirm men and women, for attendance upon whom he appointed regular canons of the order of St. Augustine. It was made a priory of Black Canons, temp. Henry I. by Archbishop William. The establishment is mentioned in the Domesday Book, and is thought to have been the first house of regular canons in the kingdom. It was burnt in 1145. An engraving in my possession, made in 1717, does not define its architectural character with precision, and it seems to have been adapted to modern uses. A small part still existing. Its site was between Northgate Street and the new military road, and is now nearly occupied by buildings. The further history of this Priory is thus told by Gostling. 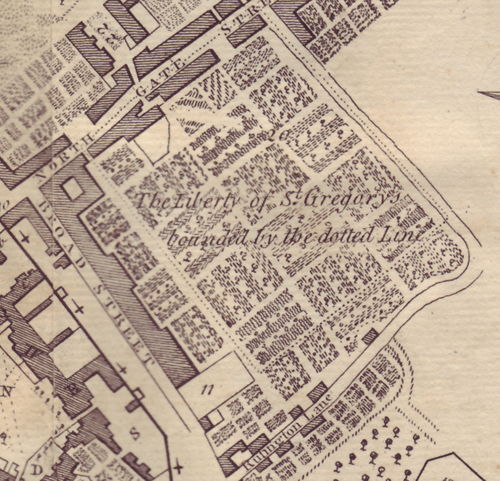 "The ground belonging to its precinct is almost entirely laid out in gardens for our market. The chapel of St. Thomas (whose ruins are, or were, lately all there) had over the door at the west end of it, a handsome old arch, which the Archbishop's lessee took down some years ago, to make a portal to his own dwelling-house, at St. Thomas' Hill; but that being sold and rebuilt, the Rev. Mr. Brockman, by adapting the front of one of his outbuildings to it, has preserved this piece of antiquity, and added to the beauties of his seat at Beachborough, near Hythe." "The priory of St. Gregory was founded by Archbishop Lanfranc in the year 1084, and was situated on the high road leading to the isle of Thanet. The founder established this house for secular canons, which Archbishop Corboil changed to regular canons, otherwise black canons, from the habit which they wore of hte order of St. Augustine. 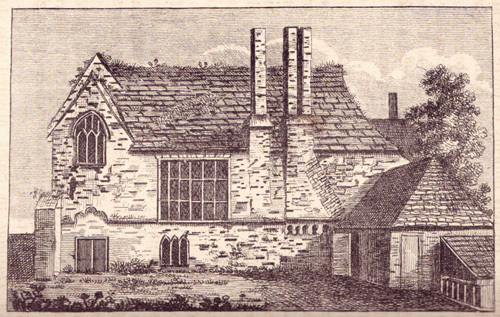 John Symkins was prior of this house at the dissoultion of it, 27th of Henry VIII., when there were thirteen religious in it, the yearly revenue being, according to Dugdale, 121l, 15s. 1d. In the same year the King exchanged the site with the Archbishop of Canterbury, and it was eventually sold to G. Gipps, Esq., he died possessed of it in the year 1800, and vested it in trust for the uses of his will. Its site was between Northgate street and the new Military road, and is now almost covered with modern buildings; a small part of the priory is, however still to be traced. The ancient house of the priory was formerly the residence of Sir John Boys, but has been many years in a ruined state." "In Northgate street was a religious house founded in 1084, by Lanfranc, for Secular priests, and dedicated to St. Gregory; the revenue, at the Dissolution, was £166. 4. 5.: the remains, consisting of parts of the walls, arches, and some windows in the Norman and early English styles of architecture, have been converted into a pottery, and a tobacco-pipe manufactory. 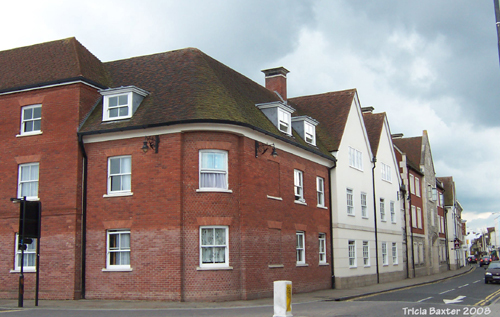 The barracks erected on the site of St. Gregory's Priory, and in other parts of the city, have been taken down, and new streets of small houses occupy their places." 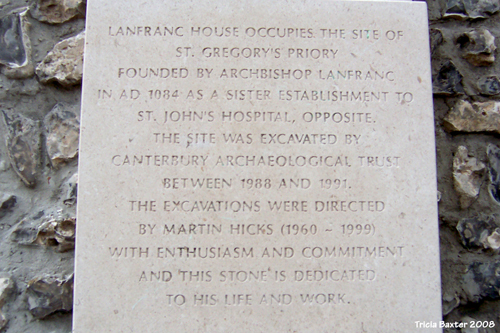 "St. Gregory is another religious house supposed also to owe its foundation to Lanfranc, A.D. 1084. It was erected for secular priests, but in the time of Henry I., it was constituted a Priory of Black Canons. Somner, however, considers that its building was divided into two parts, one for infirm men, the other for infirm women, to whom the ecclesiastics were to administer religious offices. 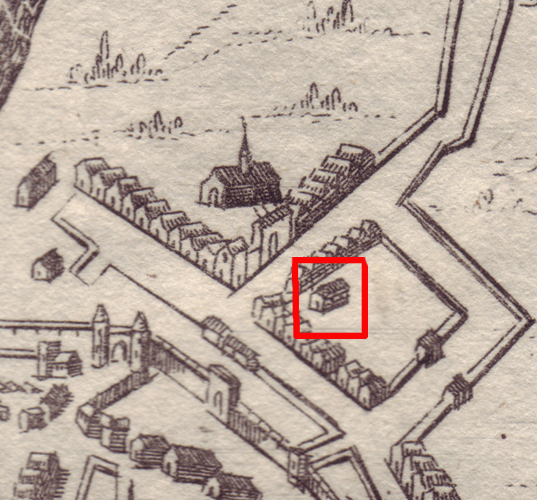 Battley informs us there was anciently the Capel of the Brotherhood of Saint Thomas the Martyr, situated in the garden of St. Gregory. At the time of the dissolution, it contained 13 Religious. Grove states its original foundation was for sick men and women. An extensive burying-ground was attached to it, not appropriate to the hospital alone, but to the parishioners of Northgate. The Canons of St. Gregory were allowed 4 acres of the best wheat and 4 acres of the best barley, cut from the manor of Northfleet." "This priory was another foundation of Archbishop Lanfranc it was intended for infirm men and women, and regular canons of the order of St. Augustine had charge of it. It is supposed to be the first house of regular canons in this kingdom. The establishment is mentioned in the Doomsday book. Its site was between Northgate Street and the new Military Road, and is now almost covered with modern buildings a small part of the priory is, however still to be traced."